Great way to spend a half-day in Shanghai. Our guide Jeremy was very knowledgable and guided us through some less touristy sections for the city. We also stopped for some tasty street food, which was an added bonus. I definitely recommend this tour. 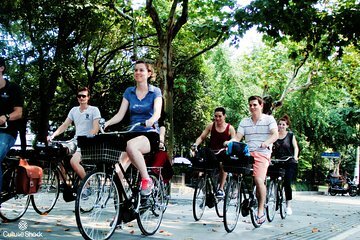 The perfect way to see a slice of Shanghai life. Thanks to our amazing guide Kat we learnt lots about the history and architecture of the area. Loved it. We did this tour with Clarisse and it was the highlight of our stay in Shanghai ! Clarisse is amazing and she knows a lot about the Chinese culture. we went to little old streets and could see the real life of Chinese people. The stop at the little restaurant was also amazing...I highly recommend this tour. Dont miss it !!!! Je recommande fortement ce tour. Clarisse est intarisable sur la culture chinoise, elle est absolument incroyable !! Vous decouvrirez les petites rues de Shanghai et le stop dans un petit restaurant de quartier est magique ! We were given a great insight into the lifestyle of Shanghai people with a real glimpse of 'old' Shanghai. Touring on bikes with an excellent guide and a small group of like-minded tourists made this a most pleasurable experience. Rose the tour guide from the Netherlands was informative, caring and had a great rapport with the locals. We saw parts of shanghai that we would never had seen by ourselves and had a great experience of day to day living in shanghai. My wife was initially nervous about the biking aspect but ended up enjoying this tour more than any other and amused the locals. It was a highlight of our trip. Awesome morning bike tour! Everything was perfect including the weather. Claire was a delightful, knowledgeable tour guide. I / we look forward to signing up for the afternoon bike tour! Fantastic tour through Shanghai , highlight of my time here, not just a bike tour ! Fantastic day out in Shanghai, wonderful guide she was a gem, the bikes were old school cool. We enjoyed a more personal, glimpse into life here. Street food snacks were excellent, something we might not have know what to order on our own. We were fortunate to have a private tour with Claire, who was fantastic. Her genuine warmth and her fluency in both English and Mandarin made it possible for us to have interactions with local residents that we otherwise would have missed out on. Every stop we made on the tour was informative and interesting, but the highlight for us was the alleys of Old Shanghai. It was so interesting to get the feel for this simple, close-knit community whose way of life is slowly being snuffed out by encroachment from developers. Although the tour was less actualy biking than we anticipated, it was absolutely worth the time and money we spent. It was the highlight of our Shanghai trip, and we would highly recommend it.